Home : About Us : F.A.Q. PACKAGE PAVEMENT® has been committed to customer satisfaction since our start back in 1951. From our early start of hand bagging and delivering cold patch blacktop to utility companies in the Northeast, to our continuous upgrading of plants, transportation, and technology to better serve our customer base, we strive to exceed customer’s expectations. PACKAGE PAVEMENT® has been in the business for over 60 years. Over this time period we have adapted and changed to promote new products and enhance existing ones. We have been on the cutting edge of packaging and bagging technology by utilizing the latest tools to produce consistent products. Each batch of material we produce undergoes rigorous quality control standards which meet or in many cases exceed ASTM (American Society for Testing of Materials). Visit www.astm.org to learn more. PACKAGE PAVEMENT® recently celebrated our 25th anniversary as a Quikrete® Licensee. This partnership gives us a unique advantage in the bagged materials industry, allowing us to develop strong relationships with suppliers of aggregates and cement. As a result, we have become one of the largest single users of Portland Cement and Spec Sand in New York State, resulting in greater consistency for our product lines. In the early 1990s PACKAGE PAVEMENT® became a Spec Mix® Licensee. With Spec Mix®, PACKAGE PAVEMENT® is now able to provide our expertise in the pre-blended mortar industry to customers looking for a customized product for any application. We have the experience of thousands of new custom jobs per year ranging from small 3 pallet orders to large-scale commercial / entertainment complexes. What does PACKAGE PAVEMENT® provide? PACKAGE PAVEMENT® is the premier supplier of packaged blacktop, concrete, and custom products in the Northeastern United States. We are in the business of producing quality, consistent, and workable products for our customers, and we have been striving to exceed their expectations for over 60 years. Before beginning any construction project, find out how we can help you create a blueprint for success. How do I get information on a product? PACKAGE PAVEMENT® has a dedicated and knowledgeable staff with an average of 15-20 years of experience in the industry. We pride ourselves on being able to offer solutions for any project large or small, with the ability to produce and deliver goods in an industry leading time frame. Email sales@packagepavement.com or call (800) 724-8193 for more information. How can PACKAGE PAVEMENT® help my company for an upcoming project? We like to use the phrase “Ultimate Customer Solutions” to describe our attitude towards new projects. Projects large or small will receive a dedicated staff that will provide ways to optimize your time, your productivity, and your schedule. To do this, we provide products and services custom tailored for the job. PACKAGE PAVEMENT®’s sales team begins with an evaluation of your job’s needs and carefully creates a blueprint including: products needed, delivery options, and scheduling time frame for the successful completion of your project. Contact PACKAGE PAVEMENT® to learn how our “industry standard” line of products are there to help you achieve your goals. PACKAGE PAVEMENT® is in the business of providing exceptional consistency and quality in industry leading time frames. Our typical turnaround time is 24-48 hours for our core brand of products and 48-72 hours for custom products. This just-in-time delivery schedule means you can have products on-demand to keep down waste, damage, and loss on the job-site. 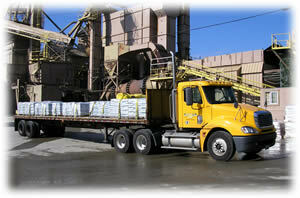 PACKAGE PAVEMENT® is one of the most experienced businesses in the custom mortar, grout and concrete product industry. We produce material for thousands of new applications per year and have been manufacturing packaged asphalt and concrete products for over fifty years. If you have an upcoming project, large or small, contact us to learn more. Click here to find out about our Spec Mix line of business, from large retail malls (New Roc City) to sports complexes (The New Yankee Stadium), the Spec Mix® division of PACKAGE PAVEMENT® has innovative and custom solutions for your construction needs. Learn about our full line of Quikrete® Products by Clicking Here. Material Safety Data Sheets (MSDS) are now available. Click here for our SDS Info Sheets.